One veteran and families of Sailors who served aboard World War II destroyer USS Abner Read (DD 526) will gather at the United States Navy Memorial in Washington, D.C. Nov. 1 at 11 a.m. to honor the service and sacrifice of those who served on the ship during the war, particularly the 71 Sailors who lost their lives when the ship struck a mine during a war patrol off the coast of Alaska, and the 22 Sailors who died when the ship was sunk a little more than a year later in the battle of Leyte Gulf. Media are invited to attend the ceremony which occurs on the 74th anniversary of the ship’s loss. Naval History and Heritage Command Director Rear Adm. Sam Cox (U.S. Navy, Retired) will provide remarks. Abner Read was in the news this past August when the stern section of the ship was discovered off the coast of Kiska Island, Alaska. The wreckage was discovered during a NOAA Office of Ocean Exploration and Research-sponsored project to survey underwater sites related to the World War II Aleutian Islands campaign. The expedition was undertaken by a team made up of researchers from the University of Delaware, the Scripps Institution of Oceanography at the University of California San Diego, and Project Recover. 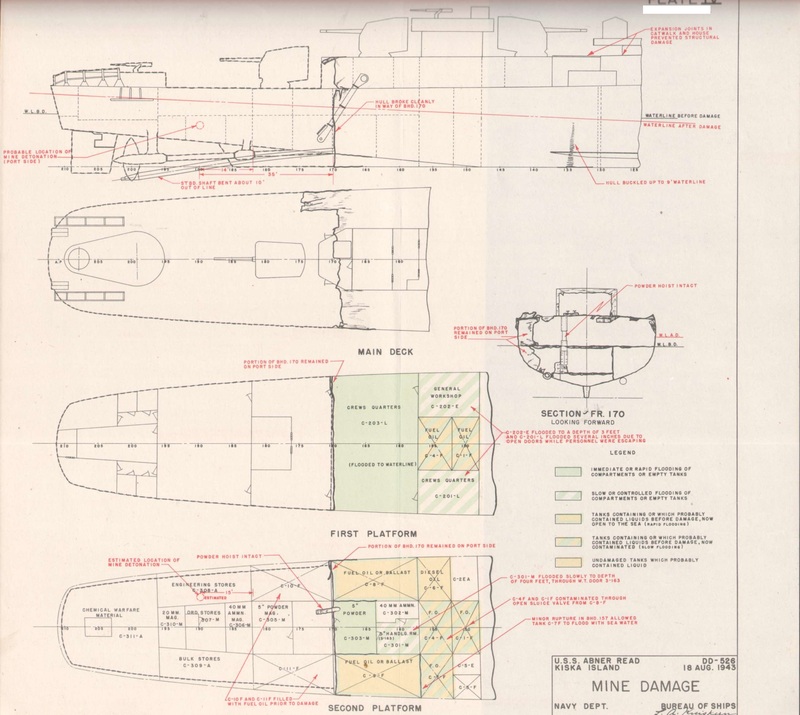 During the expedition, the team discovered Read's stern section which was severed from the hull when Abner Read is believed to have struck a mine on Aug. 18, 1943 while patrolling off Kiska. 71 Sailors were killed or missing, and another 47 wounded after the incident. Somehow the crew kept the main part of Abner Read’s hull watertight, and two nearby Navy ships towed it back to port. “This was catastrophic damage that by all rights should have sunk the entire ship.” said Cox. “Despite the surprise, shock and loss of so many of their shipmates, the surviving crewmen of Abner Read displayed extraordinary valor and determination in saving their ship. The crew's absolute refusal to give up their ship no matter what provides an inspiration to those Sailors who serve our nation today."